The Squirrel vs. The Gondoliers; or, why you shouldn’t get your PhD in Venice | The New York Baroque Dance Co. 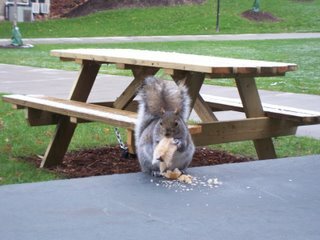 This is an example of the super-fat-completely-unafraid-of-humans squirrels that The New York Baroque Dance Company had to contend with during our residency at Cornell University. They stalked every tree-lined path on campus for students dreamily looking at the sky and thinking about Heidigger with mufins poking out of their pockets. Then they would strike!! Oh, the horror.When not avoiding these fiends, we spent our time making the adorably funny commedia dell’arte show, Harlequin’s Capers. You can read all about it (along with fabulous background information about baroque dance) here in the Ithaca Journal. After the shows were over (I only cried a little bit during the last bows), I met Jeremy in Venice!! We had a lovely time, and it was hilarious how both the Italians and the Americans would say “oh, so romantic” when I told them of our plans. It was suitably romantic, but still awfully touristy even in the lowest of the low season. We were quite lucky that it didn’t rain because in November there is always the threat of the canals overflowing, called “aqua alta”. Jeremy and I hit all the hot spots: San Marco, where we saw a poor girl being attacked by pigeons (on purpose, her parents were laughing and taking pictures, and she was quite a sport), the Rialto Bridge, the 18th. century museum, etc. etc. We were good tourists and didn’t even get lost too much. 2. seeing boats that deliver all of the food, etc. into the city, along with the garbage boats and ambulance boats– there are no cars!! 3. We always ate Tramezzini (tiny sandwiches with different fillings) for lunch.